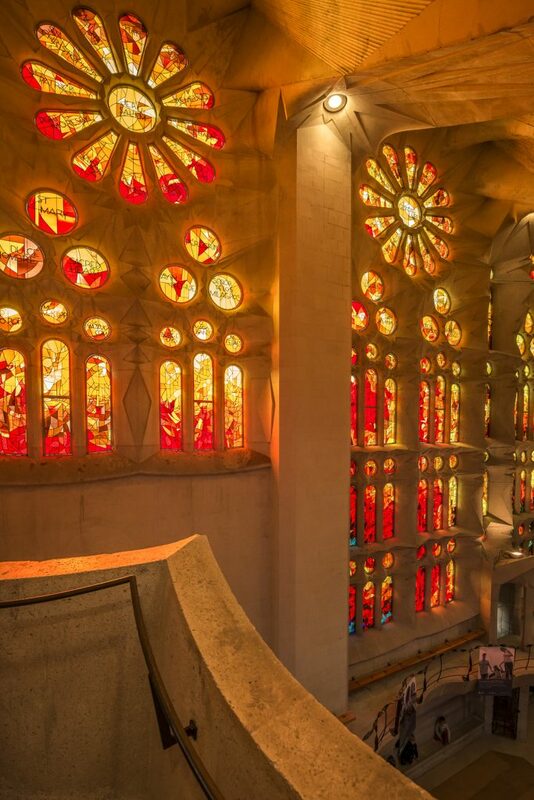 Gaudí said, “Sunshine is the best painter.” And today the experience inside the Temple truly shows he was right. Depending on the time of year, hour of the day and, even, the weather, the feeling inside can range from joyful or explosive heat to coldness and melancholy. So, it is an ever-changing symphony of colours running the gamut of emotions. And this is all thanks to the stained-glass windows. 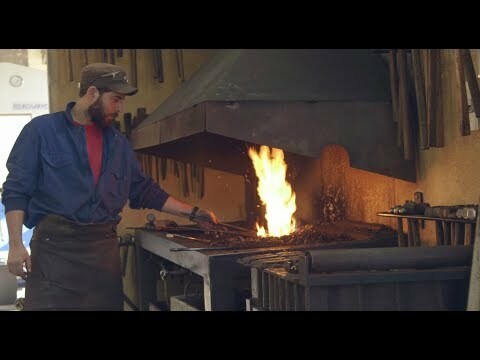 The process of creating them, however, must strike the right balance between respect for Gaudí’s criteria and today’s glass-making techniques and systems. 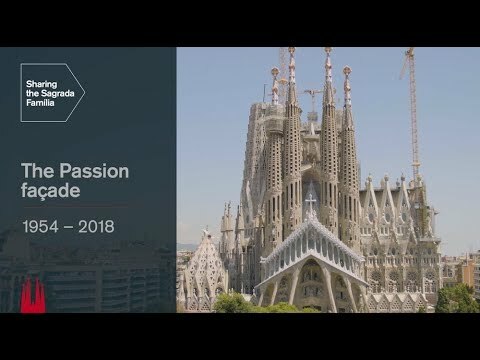 Regarding Gaudí’s criteria, several issues must be taken into account. On the one hand, we must consider that he didn’t really develop this topic much nor did he reach a specific conclusion, possibly because the windows belong to the end stage and were still far from the basic construction they were working on at the time. On the other hand, he began researching a healthy, meaning clean, milling process. He didn’t like the use of grisaille, enamel or paint, nor brush strokes that dirty the windows and block the light. His experience with four-layer windows (three primary colours and white) are an example of this desire to create depth in the figures without dirtying the window. Joan Vila-Grau, who is the artist behind the stained-glass windows at the Temple, explains that, although every single window is different, there is a sense of a whole that was achieved thanks to the general criteria applied throughout the creative process. This is influenced in each window by the corresponding iconography, but also, above all, which direction it faces and the type of light it gets, as well as the surrounding constructions, either inside or outside. 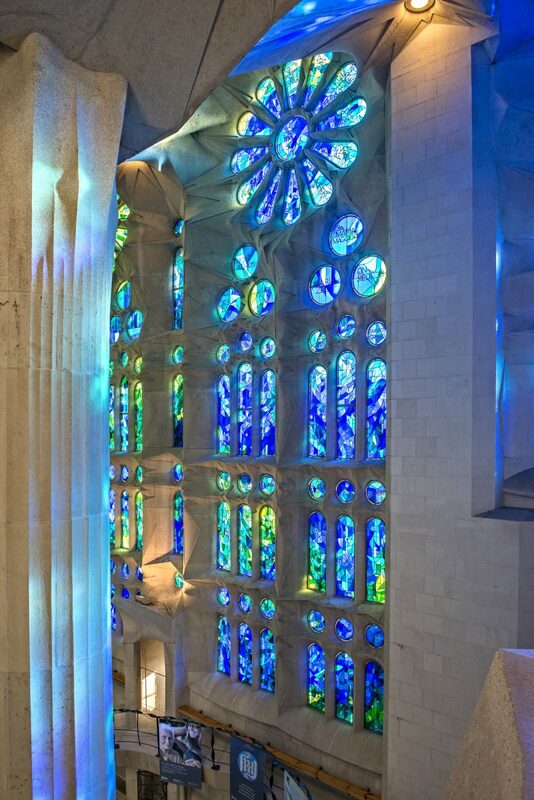 The fact that the general principles are the same, and that the direction and light have always been so important for each window, mean that, in the end, the stained-glass windows at the Temple are perceived as a single work. Each window is a unique piece, but all together they are a work of greater scope. So, in the naves, the series of windows with a similar facing and light could have been identical, but the overall vision means they were designed with a global gradient from the crossing to the Glory façade. This way, on the Nativity side, the yellows slowly move into greens and then deep blues and on the Passion side, the transformation goes from yellow into oranges and reds. One decision that had to be taken was whether the stained-glass windows would be figurative or not. Vila-Grau assumed, from the moment the Junta Constructora commissioned him to do the work, as his work was more abstract, that this decision had already been taken, or at least accepted. So, the first window he made, as if for an entrance exam, was that of the Resurrection, on the Passion transept. It was nearly the only stained-glass window with clear symbolic content established in Gaudí’s project, furthered by all the work Subirachs had already done on the exterior. 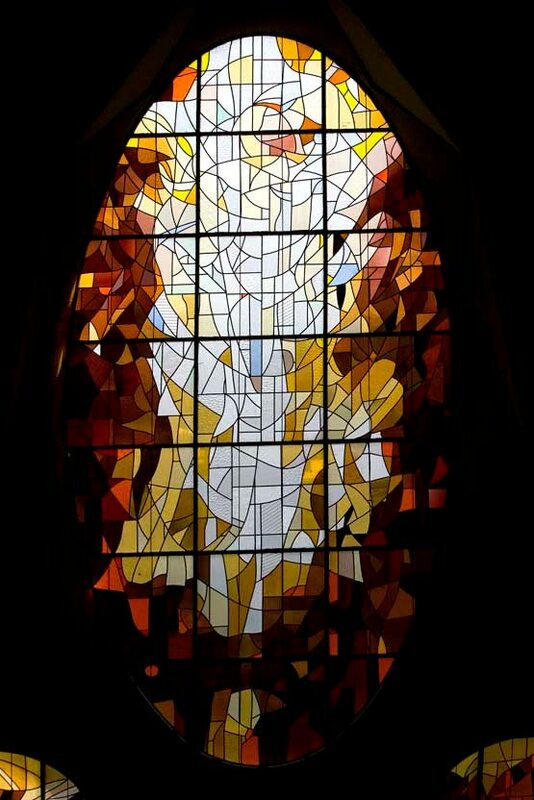 The theme of the triumph of life over death, the idea that the seed must be buried before it can bear fruit, was the inspiration that led to the concept in this window of light triumphing over darkness. While not figurative, those who are keenly aware will sense the ascending rhythm of the lead lines and, even, come to see the resurrected Christ. Vila-Grau didn’t want to explicitly draw this, but on occasion he has expressed his satisfaction that the work conveys this intention. 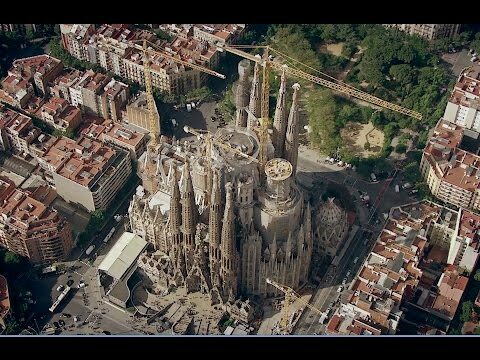 With the stained-glass windows, we also see the recurring topic of Gaudí aiming to surpass Gothic style. 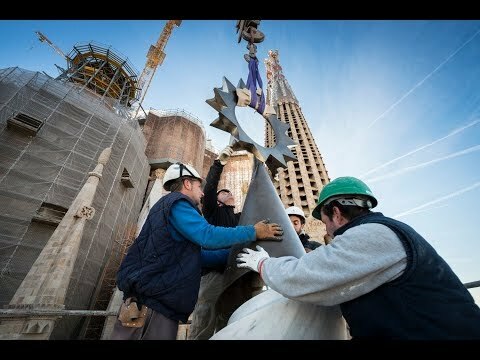 As we mentioned in a previous article, Gaudí inverted the balance of light often seen in Gothic cathedrals: at the Sagrada Família, he sought out maximum contrast and, therefore, put the most transparent glass on top to illuminate the vaults, decorated with ceramic tiles and flecks of shiny gold, and had the light decrease as it moves down, through colour, to create a setting more appropriate for reflection and meditation. The densest colour at the bottom is also the richest in iconography and closest to the faithful, where it can be read or interpreted better. Because we cannot forget that the function of medieval stained-glass windows was educational: they used images to help the people understand, as they were mainly illiterate. So, the various sections that made up the windows were used like vignettes, telling stories from the scriptures or related to the Temple itself. At the Sagrada Família, this iconography in each window is not forgotten. They feature the names of the saints and sanctuaries in each location, although their importance is secondary. 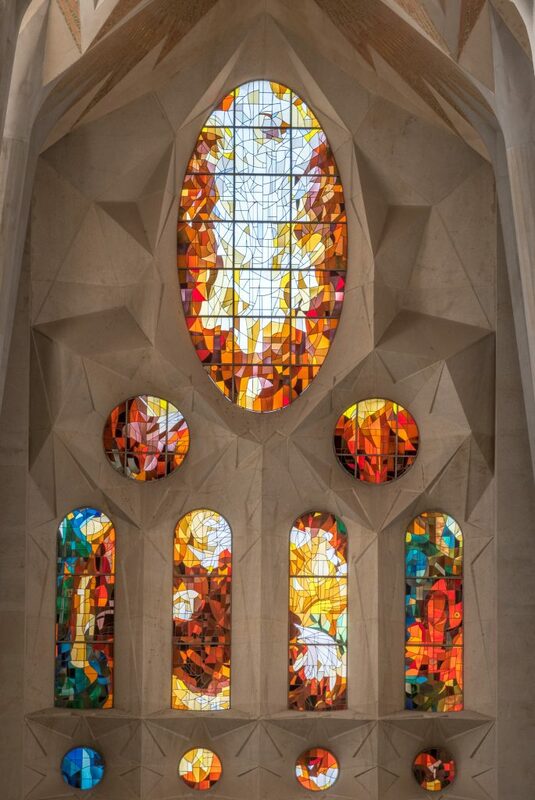 However, what was previously a result much more than an intention, at our Temple has become the main function of the windows: to create a feeling of spirituality, a setting full of light where visitors are captivated and feel part of a universe of colours and a sacred place, regardless of their origins or beliefs.